Hydroponics can be made simple and easy with Southside Garden Supply. Our selection includes budget friendly hydroponic equipment and the most advanced hydroponic equipment available. Stop in today and shop for yourself. 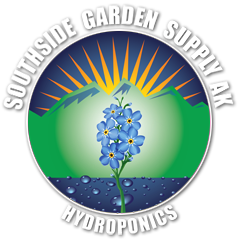 If you’re looking for the best hydroponics store in Alaska, you need to head to Southside Garden Supply located at 2809 Arctic Blvd, Anchorage for the best deals on hydroponics supplies, grow light systems, and everything else for indoor gardening! With thousands of specialty indoor gardening products by top manufacturers to choose from and an experienced crew that’s dedicated to helping you get the most out of your grow, you’ll get what you need and save more at Southside Garden Supply, with two convenient locations in Anchorage and Wasilla. We carry complete hydroponic systems, greenhouse lighting, water pumps, air pumps, fittings, tubing, trays, reservoirs, timers, controllers and much more. Best of all, we're now supporting Alaska's growing cultivation businesses with Wholesale Direct Farm Pricing on all equipment and supplies. Take advantage of pallet delivery to your door and ongoing service to keep you growing strong. We are your trusted source for hydroponics and indoor gardening supplies in Alaska. Southside Garden Supply in Alaska can help your cultivation business take root! Take advantage of our Exclusive Member Pricing and simplify your day with our 2 Super Stores in Anchorage and Wasilla. Find your hydroponic supplies quicker, and waste less gas getting here. Learn more about Indoor Greenhouse Supplies Hydroponics in Anchorage, Grow shop in Anchorage, Hydroponics in Wasilla.